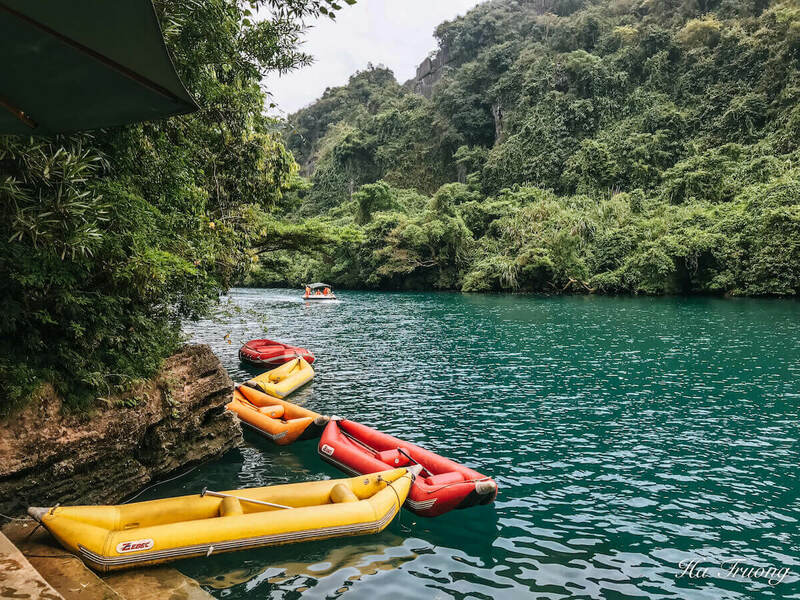 “Fun and Adventurous” is the best way to summarize my trip to Dark Cave – Chay River, a natural wonder of Phong Nha-Ke Bang National park in Quang Binh, Vietnam. Discovered in 1990, Dark cave was soon put into operation as a tourist attraction in Phong Nha. 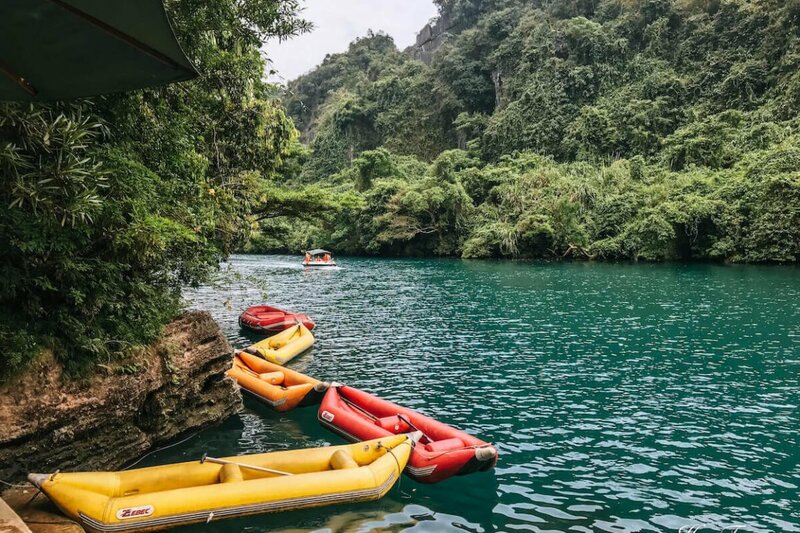 The cave is famous for lots of adventurous activities such as Zipline, kayaking, and cave discovery. I share below my experience with tips and guide to exploring Dark Cave and Chay River – a turquoise river that leads to the entrance of Dark Cave. In this article, you will find all the information that you need to know about Dark Cave and Chay River. Where is Dark Cave – Chay River? Dark Cave is located on Ho Chi Minh West road, in Bo Trach, Quang Binh, Vietnam. The location of Dark cave is about 60 km from Dong Hoi, and it takes more than 1 hours to drive from Dong Hoi to Dark Cave. 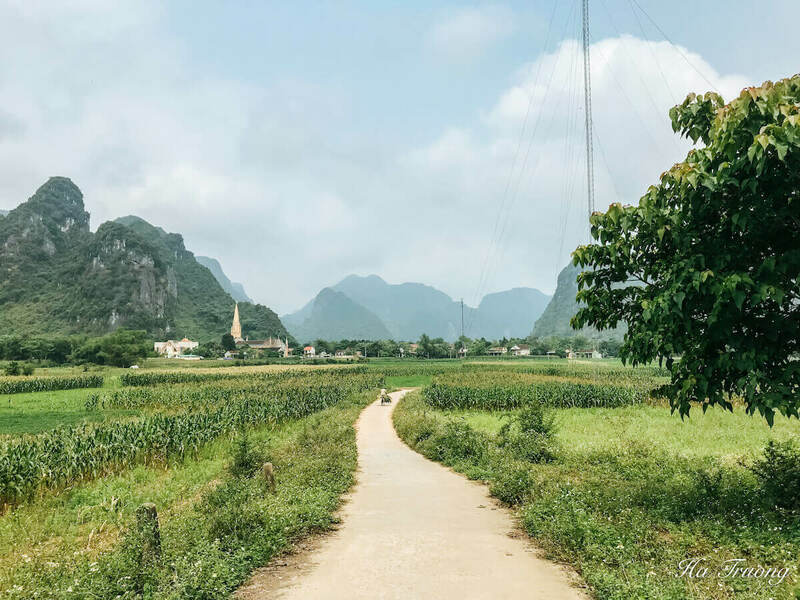 If you stay in Phong Nha town, the distance is approximately 20 km and it takes 30 minutes to get there. Do you know that Dark cave – Chay River is located only 2km away from the ecotourism site Thien Duong Cave, and 500m from Mooc River? 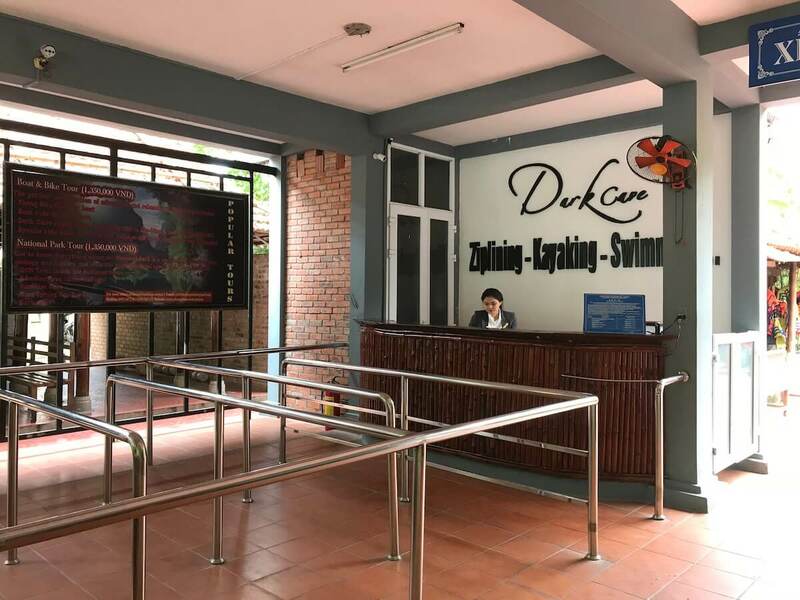 I would suggest combining either Thien Duong Cave or Mooc River in one day along with your visit to Dark cave as the location of these attractions is quite far away. 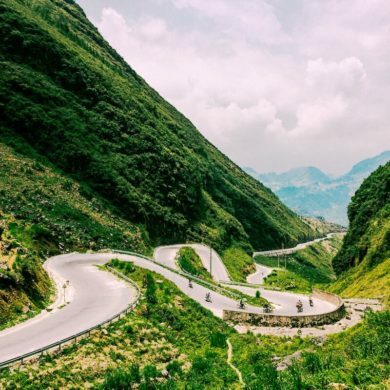 If you’re an adventurous traveler, you can rent a motorbike for one day in either Dong Hoi or Phong Nha. I rent my bike from MotorVina and love the service. 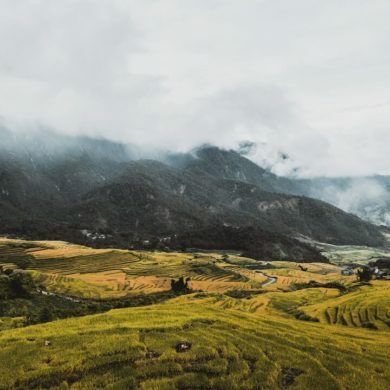 On the way to Dark Cave, you will be amazed by the scenery with beautiful rice paddle field, local houses, and small paths. Note: If you don’t have experience at driving, you should better hire a motorbike driver. If you’re traveling by group, it can be a good choice to rent a charter car for a day or more. There are several companies offering daily tours from Phong Nha/ Dong Hoi to Dark Cave. The most common one is a day tour to Dark Cave and Thien Duong Cave. Tips: Oxalis Adventure Tours company is one of the most reliable tour providers in Phong Nha-Ke Bang national park. 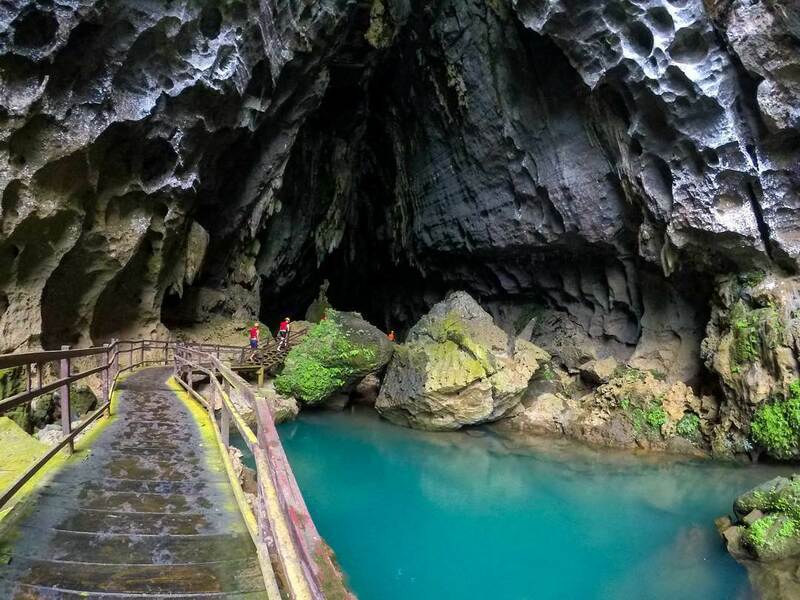 Although the ideal time to visit Phong Nha-Ke Bang attractions is from March to September, the best time to visit Dark Cave is from the middle of March to May. At this time, the scenery is very beautiful with blue sky, white clouds, and turquoise water. Also, the weather is cool and not too hot so it’s easy to enjoy the outdoor activities. From June to August, it can be crowded as it’s the high season for local tourists to visit this site. From September until March next year, the weather is cold with storms so I would not recommend traveling here. 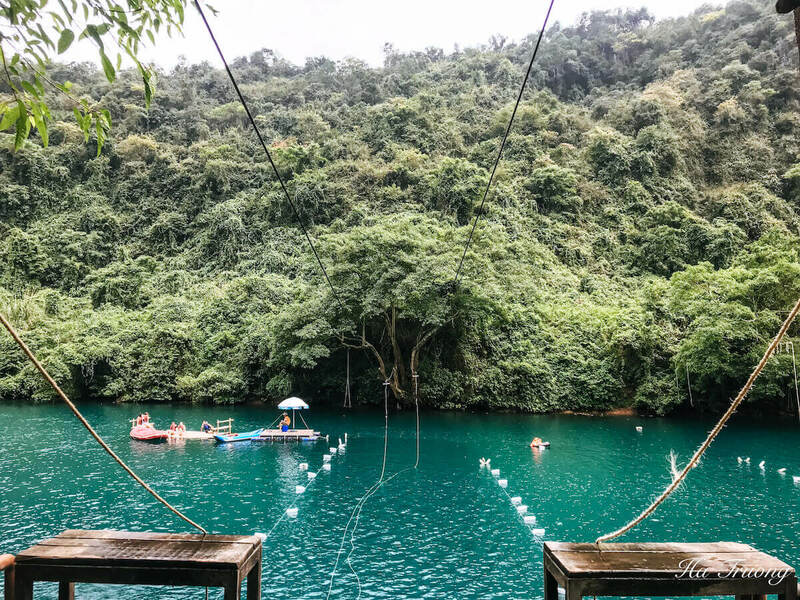 Including: Zipline to dark caves, exploring dark caves and mud baths, Kayak, Zipline river, Adventure bridges, handball and water sports games, equipment. 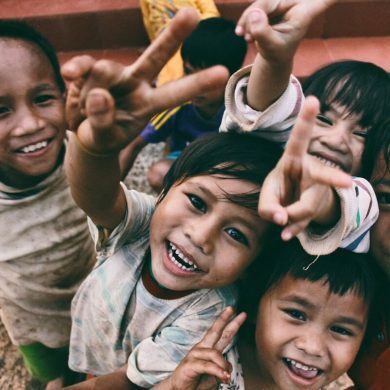 Including: Explore dark caves and mud baths, equipment, water sports games (not including thrilling games). 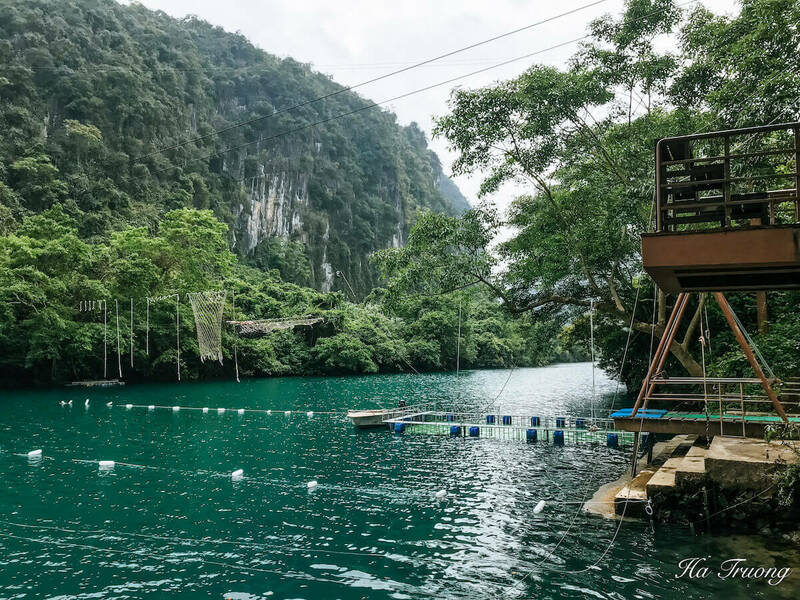 Including: Zipline to Dark cave, Kayak, Zipline river, adventure bridge, water sports games, safety equipment. When you get to the location, the instructor will give you general information about the Dark Cave. He or she will show a video of activities that visitors can do there, and introduce the activity packages. As I mentioned above, there are 2 packages that you can choose from. After deciding the package, you will need to sign a form and take it with you when purchasing the ticket. The form indicates your health and mental standards to participate in this experience. Also, there’s a part of insurance and safety protocols. If you need to rent a locker, it’s compulsory to pay 50000 VND deposit for a lock. The money will be returned after you return your lock so keep your key tight! In order to participate in the Discovery program, women are required to wear a bikini or basic swimsuit, while men wear swimsuit pants. Therefore, it is necessary to prepare them in advance or you can buy it at Dark Cave. After changing to appropriate swimsuit, you will then guided by the staff to put on a safety belt, life jacket, hat, and headlamp to ensure the safety requirements. The zipline is my favorite part of Dark Cave. To be honest, I was super scared at first and hesitated to try it due to my fear of height. However, I decided to give it a try and love it. The swing was not too fast and I could enjoy the scenery around. As the zipline was just 400 meters, it was quick to get to the other part. Tips: You can carry your GoPro or selfie stick, but be careful not to drop it. After the zipline, we swam a short distance to the entrance of the Dark Cave. Our guide gave a short instruction of Dark cave and we followed him into the cave. The cave was completely dark and brought a mysterious and interesting feeling. The flashlight mounted on each helmet was the only mean to light up the way, so we had to stay close together and not to get lost. As the path to the Dark Cave was really narrow and slippery, we had to wriggle through small slots and not to fall. After walking about 100 meters to the cave, I could feel the mud under my feet and touch them on the surrounding. It was amazing to explore the cave even though it was just a short trip. We found a natural mud bath after walking 500m into the cave and relaxed there at about 10 to 15 minutes. This mud bath was formed thanks to the high level of water in the rainy season. The mud bath has essential minerals which are good for skin and relaxing purposes. After relaxing at the mud bath, we walked to a small lake to wash the mud layer and enjoy the feeling of fresh skin after natural Spa course. We then walked back to the entrance and got on the kayak to the activity spot. It was fun to do the kayak racing between our group. From February to August, the weather is sunny and Chay river has crystal clear water. However, from September to October, it starts to rain a lot, and Chay water becomes muddy caused by the soil that flows into the river. From December to January the water is really cold and difficult to swim. From March to August is the best time to enjoy outdoor activities on Chay River. There are a few games that you can do there, and I love the zipline one. Sliding the zipline to the middle of the river and dropping from above to the cold water creates an extreme feeling. Tip: There’s a kid swimming pool on Chay river as well, so it’s a great bonus if you’re traveling with kids. 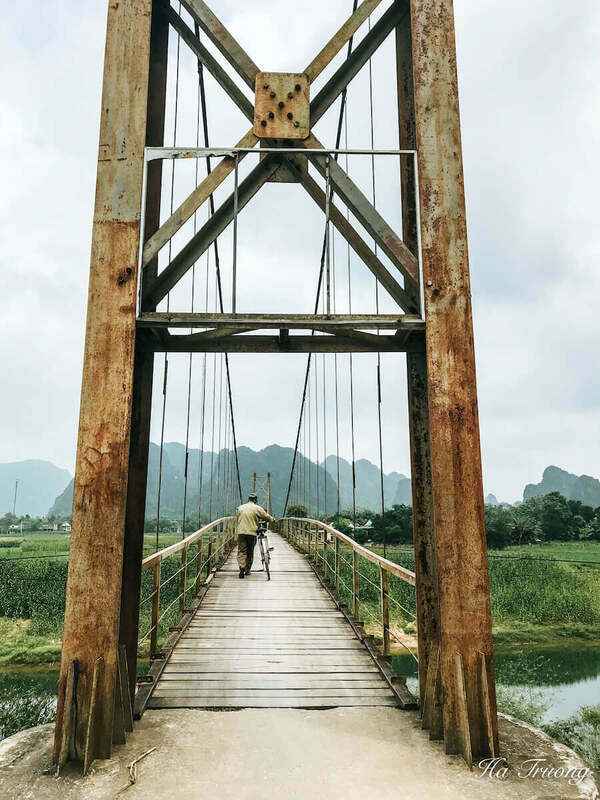 I would suggest staying in Phong Nha instead of Dong Hoi to save your travel time between the attractions. Also, Phong Nha town is really lovely and the surrounding nature is stunning. I stayed at Shambalaa Hostel, a budget sister hostel with Easy Tiger. I could also use the same service in Easy Tiger such as swimming pool, free beer hour, free bicycle rental and free guidance every morning. 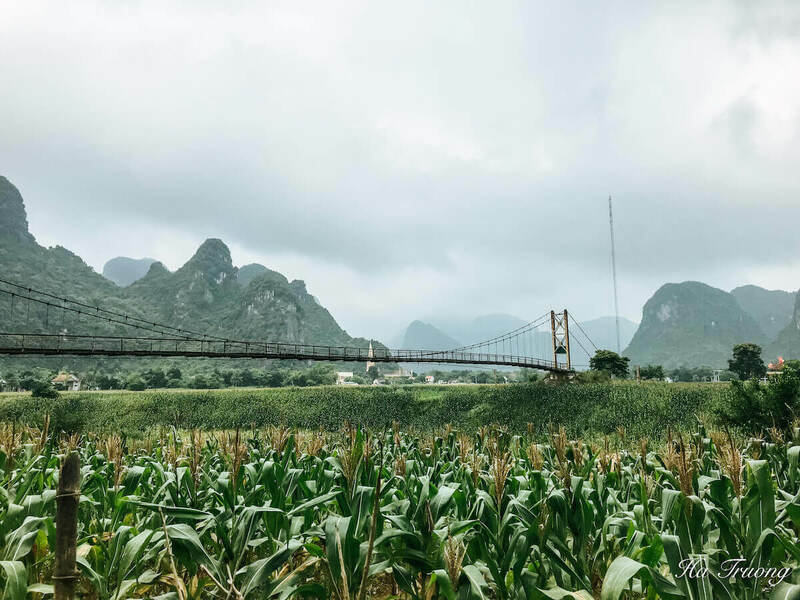 If you’re looking for a romantic getaway in Phong Nha, Phong Nha Farmstay (also the same chain with Easy Tiger) is an excellent choice. If you’re a guest from either Shamballa, Easy Tiger or Phong Nha Farmstay, you can use each location’s facility such as swimming pool. There’s a free transport pickup service from Phong Nha Farmstay to Easy Tiger every evening at 7 pm.